Air powered vehicle, also known as air compressed vehicle, is a green vehicle that uses a compressed air engine, an alternative of the internal combustion (IC) engine, and works on the principle of compressed air technology (CAT). An air powered vehicle utilizes compressed air, a non-polluting fuel, as a power source in order to run the vehicle. Rise in cost of fossil fuel, owing to its limited stock and availability, and surge in demand for emission-free vehicles have led to the development of the air powered vehicle. The air powered vehicle offers long life of the vehicle, high energy density of compressed air, and low toxicity as compared to other alternatives of the IC engine vehicle. Increase in air pollution has prompted and encouraged global regulatory bodies to develop low emission vehicles. This has boosted the development and introduction of air powered vehicles. The air powered vehicle is a solution to the energy shortage and environmental deprivation. Evidence recommends that transportation pollution accounts for about 50% of total health impacts instigated due to harmful carbon emission from fossil fuel-powered vehicles. This is a key factor that is likely to boost the demand for air powered vehicles during the forecast period. Furthermore, the air powered vehicle is economical, requires low refueling cost, and is more efficient than the conventional fossil fuel-powered vehicle. Moreover, the limited resources of fossil fuel are anticipated to propel the air powered vehicle market during the forecast period. An air powered vehicle offers numerous advantages such as easy to maintain, superior comfort, and no pollution. Furthermore, unlike battery operated electric vehicles or hybrid electric vehicles, the air powered vehicle is economical and its vehicle parts, such as compressed air tanks, can be recycled or predisposed with lesser pollution than the batteries used in electric vehicles. Air powered vehicles are lightweight vehicles, which makes them more efficient. Consequently, the air powered vehicle market is projected to expand at a significant growth rate during the forecast period. Low speed of the air powered vehicle coupled with limited infrastructure for refueling is a major factor that is likely to hinder the air powered vehicle market during the forecast period. Furthermore, rise in adoption of electric vehicles, owing to emission concerns and government subsidies and incentives being offered on purchase on electric vehicles, is another factor that is projected to hamper the air powered vehicle market during the forecast period. The global air powered vehicle market has been segmented based on energy mode, vehicle type, and geography. In terms of energy mode, the single energy mode segment is projected to lead the air powered vehicle market. Demand for emission-free vehicles is higher in urban cities and developing towns. The single energy mode air powered vehicle employs only compressed air as a power source. The segment is projected to hold a prominent share of the market during the forecast period. Based on vehicle type, the passenger vehicle segment is expected to account for a notable share of the air powered vehicle market. Rise in regulation on emission in cities and sub-cities is projected to boost the air powered vehicle market, as an air powered vehicle is less polluting and is projected to comply with emission regulations. This, in turn, is anticipated to boost the air powered vehicle market during the forecast period. Furthermore, rise in demand for lightweight and compact vehicles, owing to the increase in demand for efficient vehicles, is expected to propel the air powered vehicle market during the forecast period. In terms of geography, Europe and Asia Pacific are projected to account for a prominent share of the global air powered vehicle market. This due to the higher rate of adoption of vehicles, coupled with their relatively low cost and rise in concerns about carbon emission. Furthermore, rise in export of vehicles in these regions is also estimated to boost the sales and production of vehicles during the forecast period. Australia, Italy, France, Spain, India, and New Zealand are projected to lead the global market during the forecast period, owing to the presence of production plants of air powered vehicle manufacturers in these countries. 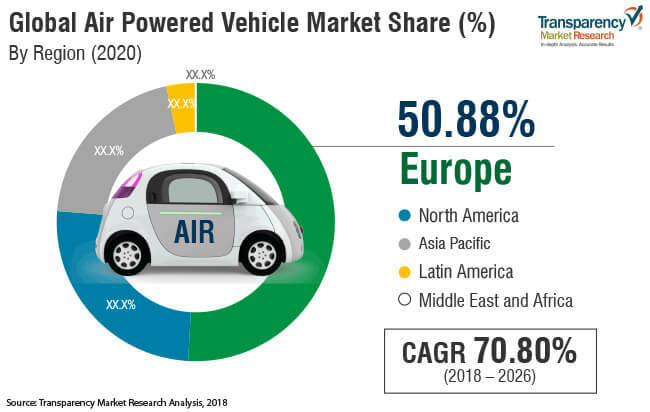 Major players operating in the global air powered vehicle market include Motor Development International SA, Tata Motors, Magnetic Air Car, Inc., Engineair Pty Ltd, Honda Motor Co., Ltd., and Groupe PSA. Among global manufactures, Motor Development International SA is a pioneer of the air powered vehicle technology. Expansion and joint ventures undertaken by the company are projected to consolidate its position in the market during the forecast period.